10 Strawberry Street WTR-16 Whittier Creamer 11 oz. TigerChef > Dinnerware > China Dinnerware > 10 Strawberry Street >< Whittier Accessories > 10 Strawberry Street WTR-16 Whittier Creamer 11 oz. $2.29 Royal ROY TS 461 Stainless Steel Stacking Creamer Server 10 oz. $2.49 Royal ROY T 400 Stainless Steel Creamer Server 10 oz. $3.39 Crestware SHWSTS Stacking Creamer 10 oz. $42.99 10 Strawberry Street WTR-3JUG Whittier Milk Jug / Creamer 4 oz. $91.99 10 Strawberry Street RW0016 Royal White Creamer 9 oz. $105.99 10 Strawberry Street SL0016 Silver Line Creamer 8 oz. Perfect for tabletop use, the 10 Strawberry Street WTR-16 Whittier Creamer 11 oz. is a great addition to any restaurant, hotel, or cafe. 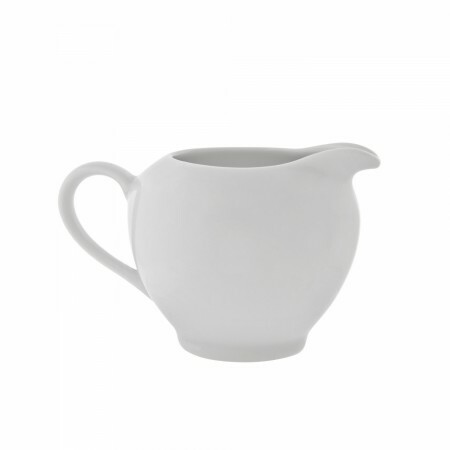 This creamer is designed with an ergonomic handle and a well-defined spout for easy pouring. Exquisitely crafted from white porcelain, this creamer provides a timeless and simple charm while being strong enough to endure heavy duty use. Dimensions: 4-3/4" x 3-1/4" x 5-1/4"